One of the most important aspects of SQL Server administration and maintenance is the ability to review and changing the existing configuration of the server. In Part 01 of this tutorial series, I had mentioned that one of the key responsibilities of SSMS was to replace the erstwhile SQL Server Enterprise Manager – the interface that is used to manage & maintain the SQL Server instance configuration. Today, we will look at some of the windows and wizards that can be used to configure your SQL Server instance. Using the Object Explorer, you can review the instance-level configuration (provided you have sufficient privileges, of course) for all servers that you are connected to. Simply right-click on the instance name and select “Properties” from the pop-up menu to launch the SQL Server instance properties window. The base or “general” view of the window is a read-only view that provides details on the SQL Server build, hose operating system version, number of processors and memory, SQL Server collation and high-availability configuration values. Navigating out to any of the child nodes (“Database settings” node visible in the screenshot below), allows us to view two sets of values – the “configured” values, and the “running” values. Configured values: These are editable values, and display the configured values for the options on this pane. If you change these values, click Running Values to see whether the changes have taken effect. 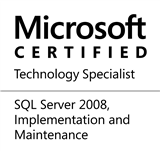 If they have not, the instance of SQL Server must be restarted first. Similar to the instance-level properties page, simply right-click on the database name and select “Properties” from the pop-up menu to launch the database properties window. Please note that this window does not have the concept of “configured” and “running” values. Any changes you make are in effect for ever new connection to the database going forward. The properties page is available for every distinct object visible within the Object Explorer. This entry was posted in #SQLServer, Blog, Imported from BeyondRelational and tagged #SQLServer on February 9, 2012 by nakulvachhrajani.